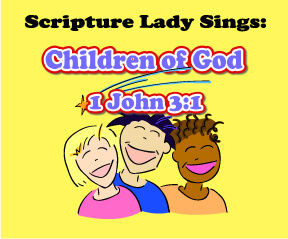 Sing the Bible song for 1 John 3:1 called “Children of God” to remind your kids that God wants them to be His children and that He loves them very much. I wrote the Bible song for 1 John 3:1 called “Children of God” for one of my very first programs called “The Fruit of the Spirit.” I needed a great Bible verse that proclaimed the lavishness of God’s love and 1 John 3:1 was the winner. Isn’t it amazing that God’s love for us is abundant! We can’t even imagine how big God’s love for us is. And to top it all off, when we believe in His Son Jesus Christ as our Savior, we get to be called His children! Click HERE to learn how to get the downloadable song and video for “Children of God” for only $2.49. That we should be called children of God, Ai-yai-yai-yai! Since 1 John 3:1 makes the promise that we will be called God’s children when we believe in His son, the following game will be good to talk more about God’s promises. 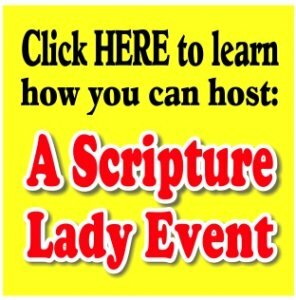 If you liked learning about the Bible song for 1 John 3:1 called “Children of God”, then sign up to receive Scripture Lady’s Free Email Kid Tips packed full with creative ideas and receive 12 FREE Bible downloadable resources to help get the kids you minister to excited about the Bible! Just go to www.MyFreeBibleGames.com to fully subscribe.